Catania, at the foot of the Mount Etna and the Cyclops Bay with its long history of maritime activity. Let’s explore Catania & Cyclops Bay together, local friendly staff and comfortable vehicles at your disposal. Catania is an ancient city both medieval and baroque destroyed by earthquakes, by the Etna eruptions and by different wars. For this reason, here there are very few historical constructions: in the Catania Cathedral you can see the ancient ruins of a Roman amphitheatre, of some Roman spas and of some Arab-Norman palaces. This city was rebuilt during the XVIII century. Catania is located at the bottom of the Etna volcano on the Ionic coast. It is an important industrial centre and its territory characterized by the presence of many citrus plantations. Today Catania historical centre is crossed by two main streets: the first one is Via dei Crociferi where you can admire ancient palaces and baroque churches, the second one is Via Etnea that ends with a wonderful view of the Etna. Here there is the Catania University that dates back to the 1434 including the Volcanological Institute with its museum and the Astronomy Institute. The Dome Square (Piazza Duomo) is the main square in Catania, being characterized by harmonious XVIII century palaces and by its central monument representing the symbol of the city: the Fountain with the Elephant. This is a Roman monument made up by stone formed by lava. Always in this square you can admire the Cathedral with the Sant’Agata Chapel where there is the very precious Sant’Agata treasure and the Palace of the Elephants (Palazzo degli Elefanti) that is the seat of the Catania municipality. From this square you can arrive to the most important street of this city: Via Etnea where there are wonderful baroque buildings with their lava powder façades and many shops and pastry stores. 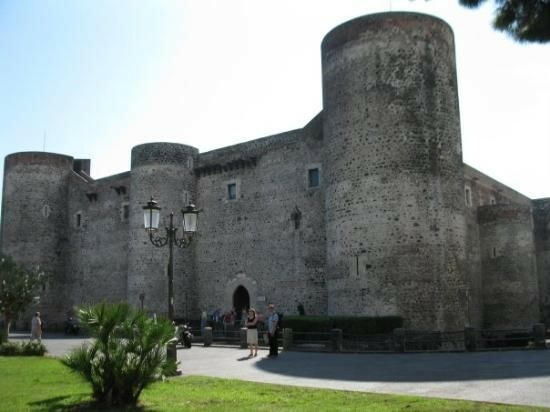 The Ursino Castle is the unique medieval construction visible today in Catania. Built in 1240 to protect this city from the sea but it was also used as a royal residence and as a prison. In 1934 it became the seat of the Civic Museum where you can admire various ancient paintings, sculptures and ceramics. 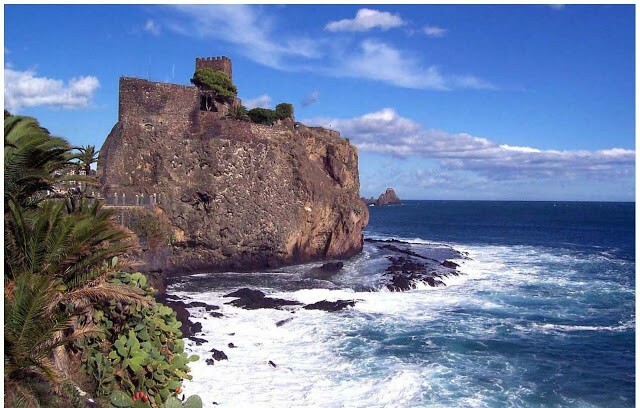 Drive past the ancient village of Aci Castello, popular destination for swimming sunning and snorkeling. 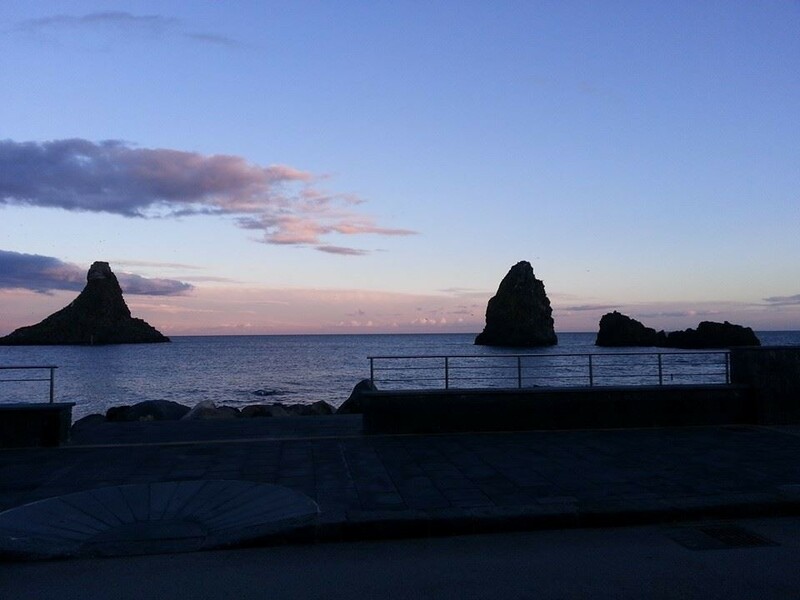 Aci Castello marks the beginning of the so-called Riviera dei Ciclopi that rises from the sea just beyond the towns.It is said that blinded Polyfemus slung three rocks broken from the Etna at Ulysses as he and his men escaped from the Cyclops in their ships. A few Km north is Acitrezza a fishing village setting of Giovanni Verga’s 1881 Novel I Malavoglia. The bay of Acitrezza, with its amazing quantity of finds, must have been in the remotest times a busy landing and mooring place, thanks also to the presence of colossal natural breakwaters like the faraglioni (“needles”) and the Isola Lachea. That is confirmed by the finding (1975) of numerous fragments of amphora of varying provenance, datable to between the 1st and 7th centuries AD. The sea off Aci Castello did just as well, yielding a group of amphora from various epochs, going from the archaic age to the late republican one; these can now be admired at the Civic Museum in the little town. Natural breakwaters and the Isola Lachea.